Before I start telling you the story, I’m going to do an experiment. I’ll write the summary of this post first, just to stick you around, in case you are one among the people who don’t read to the end. Myntra is India’s largest online fashion and lifestyle store, as they say. Which is owned by Flipkart, one of the big players in Indian E-commerce. I found a little opening in the flow of their online movement and used it to collect some information(not private though). Using this information we can see the way ‘online shopping’ is escalating in the country, and the role Myntra and the people are playing in it. Let me tell you, how did I get started with this. All this happened recently, when I was looking for some T-Shirts with my friend. We placed a shared order for two and a pair of shoes. Whenever you order from Myntra, you get a text message on your registered mobile number, giving you a link where you can track your order. Each order is given a unique identifier of length 4 because it’s a shortened URL to fit well in a text message. I opened that link in my phone and it worked, saying that the details of your order are yet to be updated. Then I tried a different URL, not mine, of course, all thanks to my disruptive mind. It worked again, now this was something to pay attention to. You know, 4 is a nanoscopic number if a computer is your best friend. I think you can guess what happened next, I couldn’t sleep properly thinking about my next move to just have all the order details. Right from crawling and storing the data to analysing it. Being a pessimistic person, as one of my friends calls me. I end up thinking too much about all the possible edge cases. Something similar happened with the design of the crawling system. As the saying goes, “A thief believes everybody steals”. I was afraid that my collection signatures(IP) will be blocked. If you have read my last post Jump in to ride all the Bangalore taxis, at once; I said that you should not hit the resource at a constant time period, it’s a basic heuristic to identify bots. I considered that, it was a simple thing. Now comes the main thing I was afraid of, “What if they catch me while trying to collect all the orders in a sequential manner (alphabetically increasing uid)”? As I couldn’t take a risk of losing the data, I designed my solution around it. I developed two things, Engine and Station. Engine is the one who takes care of the identifier generation and distribution. It uses a little group theory and anagram properties to generate non-sequential unique identifiers of fixed length. It generates them in advance and serve you on demand while taking care of the stock by generating in the background when you start approaching the bottom of the vessel. To know more about Engine, you can stalk its repository. Station is a Node.js package(private obviously) running a Nightmare instance for headless browsing. From Engine, it collects the next set of identifiers to fetch and then assemble all the necessary information before shipping it to the storage. Together they solve the problem with sequential crawling. Now one more thing, the collection signature(IP) is still vulnerable to blocking. I found a (working) solution for it right on the Engineering blog of Myntra. They have an interesting post named Dynamic Bot Detection Using Bloom Filters, which labels you as a bot if you have sent relatively more requests in the past 60 seconds. So the time difference station assigns between two consecutive requests is dynamically set such that the Bloom Filter is unable to catch it. Planning too much on the Information Retrieval part has been a good exercise though, I’m thinking about working on a Machine Learning approach of Bot Detection, where movement of a user from one page to another on service/website is mapped as state transitions of a Markov Chain, and anyone who violates the transition probability range is a suspicious visitor. Rough idea, leave that for me. As I read more and more research papers and live next to some great statistician’s Internet Residences, I know that you can’t conclude a thing from a small dataset. In the dataset that I have collected, there are 1045 Returned Orders, 4406 Cancelled Orders and 6368 Completed Orders. Returned Order means the package was returned back due to some reasons, and Cancelled Orders means it was cancelled by the customer before shipping. This could have been a bigger one, so I’ll try not to conclude a result here but we can see the customer behavior and the service Myntra provides. Coming to a result from this data would be a case of overfitting essentially. Although the dataset is small, it’s distributed over a time continuum instead of being a discrete segment, because of the internal working of Engine. We are all set to take off now. As long as I remember, I have ordered something online in the evening, around 06-07 PM. But this is not the case for everyone else. We can see that there are two concerted segments. One from 09:00 AM to 05:00 PM in the evening and the other is from 06:00 PM to midnight. Not many orders are there during the bed time, after midnight till the dawn. The morning peak is around 10:00 AM, which is near the usual opening hours of Myntra’s big discount sales. Returned Orders are present throughout the days. The presence of orders at every possible time of day shows the ease in the life of people using ‘online shopping’. You have got a need and there are platforms to fulfill that. Otherwise, why would someone order at 02:00 AM in the morning? Myntra also runs a same day delivery program where they ship your order in 24 hours, across the country. And in our dataset, a significant number of such orders were placed after midnight. 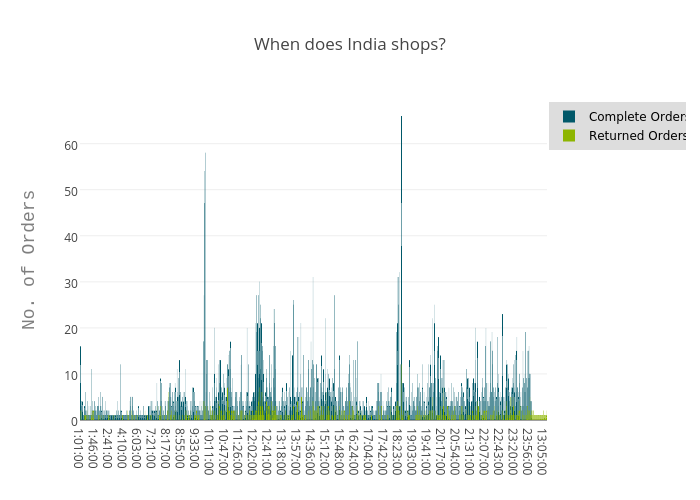 From where does India shops? Here is a clustered map of places in the country, that I found as final destinations of completed orders. This means that the map ignores the number of orders at a place, it just represents the geographic distribution of the orders. Also, it doesn’t count a locality multiple times. For example, Agartala has 2-3 different final destinations but they are clustered to a single place/centre, Agartala COD Centre 3. I was magnificent to see this map when I plotted it first time. Not because my program worked, but to see the markers in extreme areas of the country, especially in the Northeast India. It’s good to see that almost every region of the country is here. There are 432 different places in here. You are free to zoom in and check out your region, if available. After seeing this big coverage I would say, they can expand easily to Bangladesh. I have used Google’s Geocoding API to convert a place name to its coordinates. 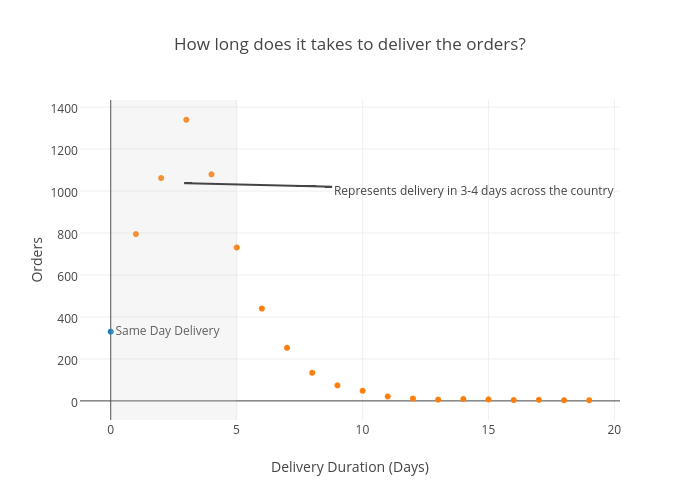 How long does it take to deliver your order? If you live in north India or near(measured in terms of direct road connectivity) the warehouses of Myntra, you can have your package in 24 hours. In the dataset, many orders from Nation Capital Region, Jaipur and Bangalore have delivered in the same day. Otherwise, majority of the orders takes 3 to 4 days across the country, except the North East(Guwahati, Imphal) and West Coast(Mumbai Parel, Antop Hill) region. I have calculated the delivery delay by subtracting the time of order being placed from the last event time in the events timeline of a complete order. The timeline consists of all the sub-details like ‘Order is placed’, ‘Order is packed’, ‘In transit’, ‘Arrived at delivery center’, ‘Order out for delivery’ and ‘Delivered’ etc. Which is error prone because they seems to update some order after awhile. At the tail of the curve, the delay in some cases seems to be caused by customers actually, some reason were ‘CID - COD(cash on delivery) AMOUNT NOT READY’, ‘Consignee Out Of Station; Shipment un-delivered’, ‘Undelivered due to - Consignee Residence Closed’ etc. Having a great logistics service is a key point for online shops. Both Myntra and Flipkart have their own such services named Myntra Logistics and EKart Logistics respectively. To deliver products out of their range or to overcome the heavy demand during big discount sales, they ship the products with third party logistic providers. 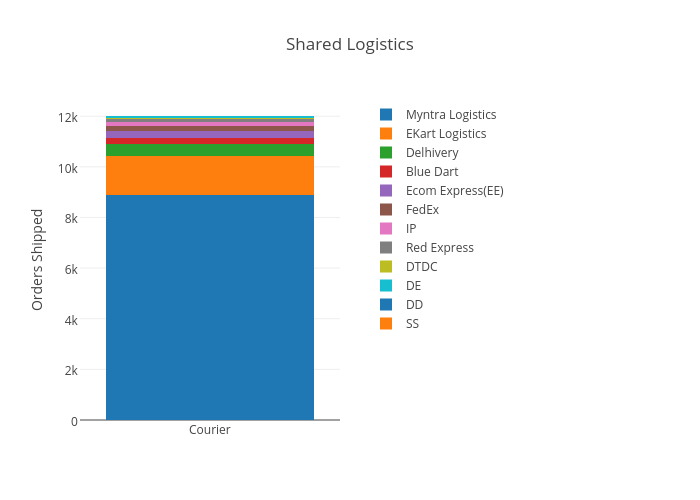 In the dataset you can see that majority of the orders have been shipped by Myntra Logistics itself, and then by EKart. Delhivery is an emerging logistic solution provider in the country. Here we can see the regions in which FedEx and DTDC were used for delivery. ‘End of Reason Sale’ (EORS) from 18-19 July was one of the biggest sales by Myntra in the year 2015. It was after when their previous sale faced criticism because of technical glitches in May 2015. EORS started on 18th July from 08:00 AM. Here is a heatmap of order from dataset ranging from 17th July to 20th July. 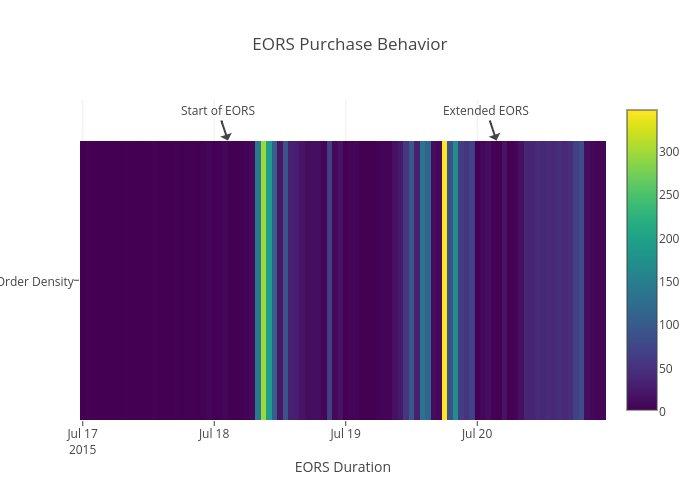 We can see a pattern similar to the sale days for 20th July, which supports the notion that EORS was extended after its official period for some styles. Myntra being an online shopping service mainly, also owns in-house fashion brands like Roadster, Dressberry, Anouk (for women), Mast & Harbour, Kook N Keech, Yellow Kite (for kids) and Invictus etc. 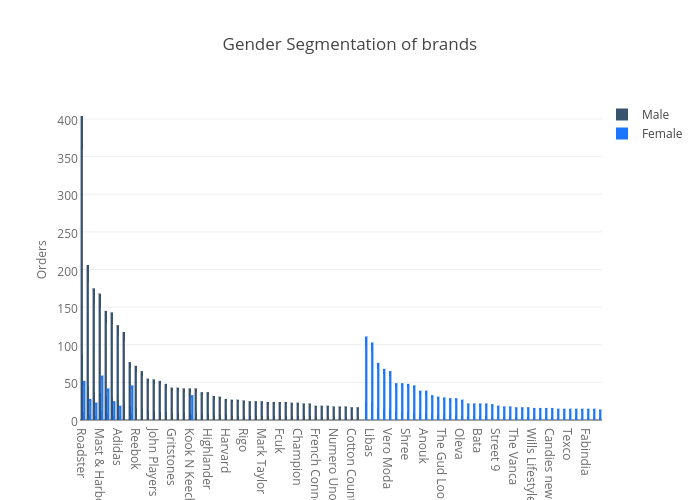 Here is an approx gender segmentation of brands(top 50 in the dataset) on the platform. Do small shopkeepers purchase online to sell in their locality? What do you generally purchase online? Whatever it’s, but you don’t actually buy 3 shirts of the same type, do you? This is something I found suspicious when I was looking in the dataset for orders having a lot of products in one shipment. Does small shopkeepers purchase from Myntra to sell in their locality? This picture shows products in a shipment which contains shoes only, of similar types. Although it’s exactly how the selling process works, you buy from a person and sell to someone else. But in this case, it seems weird to me. I thought ‘online shopping services’ are just adjacent node to us on the Internet Services Graph and this is how people use it. This indicates towards the existence of a community which is still away from the Internet, its benefits and is being cheated. Cheating in the sense that shopkeepers may buy from online services during sales and then sell them at relatively high prices to local customers. Although I have said that I won’t conclude results from this data, but I guess we can’t deny some facts. ‘Online Shopping’ is a perk that the boom on Internet and Startups has given to the country. It’s shaping the economy by creating a variety of employments. Still a lot of people are yet to go through this makeover. As the number of Internet users is growing in the country, we can expect more good to happen. I think a simple solution can be employed here to avoid intruders. To ask for the associated mobile number while checking details of an order, if the user is not logged in. One can guess the unique id for orders but not the mobile number. This is going to be a little contradictory. According to Oxford Dictionary, Disclaimer means “A statement that denies something, especially responsibility”. I won’t do that. This time again, I’m aware that such collection of data is a wrong act in Internet terms. But I can’t control myself when I get such an idea and some questions that can only be solved by visualizing the data, referring to Anscombe’s quartet. I just wish I’m not getting prosecuted for this. The dataset doesn’t contain any private information(name, mobile number, home address) of someone, it’s not at all available. Remember the Engine and Station? I have decided not to open source the Station, which was used to collect the data. Almost all programs I have used to analyse the data are available at Fuel, without the actual data I have collected. If you are reading this, you have passed my experiment. Let me gift you a free Happy New Year wish.